Paramount Trading (Jamaica) Limited, for the nine months ended February 2019, recorded a slight 1% decrease in total revenues to $1.03 billion from $1.04 billion reported in 2018. For the quarter, revenues declined 5% to close at $329.79 million (2018: $348.08 million). Direct expenses closed the period at $690.27 million, a decrease of 6% relative to the $734.82 million booked a year ago. As a result of the decline in direct expenses, gross profit grew by approximately 12% to $336.79 million (2018: $300.44 million). For the quarter, gross profit closed at $104.17 million relative to $99.98 million reported in the prior corresponding quarter. Other operating income amounted to $3.05 million for the nine months period, a decline of 28% compared to $4.20 million booked for the previous year’s corresponding period. For the third quarter, other operating income fell 61% to close at $636,500 (2018: $1.64 million). Share of profit from joint venture closed at $4 million (2018: $nil) and for the quarter amounted to $1.91 million (2018: nil). Administrative expenses climbed 25% to $270.15 million, up from the $215.53 million recorded for 2018. Selling and distribution expenses surged by 19% for the nine months to close at $23.28 million (2018: $19.58 million). As such, operating profit amounted to $50.42 million compared to $69.53 million for the same period for the prior comparable financial year. For the quarter, operating profit went down 58% to close at $4.61 million (2018: $10.94 million). Finance income amounted to $801,663 (2018: $6.27 million), while finance cost fell by 61% to total $3.67 million (2018: $9.32 million). For the quarter, finance income and finance cost closed at $7.04 million (2018: $1.35 million) and $3.76 million (2018: $ 3.42 million), respectively. Pre-tax profit for the period totaled $47.55 million, 28% less than the $66.48 million reported in the prior corresponding period. Taxes were charged for the period amounting to $2.03 million relative to nil in 2018. 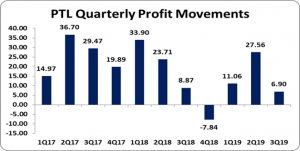 As such, net profit closed at $45.52 million, a decline of 32% (2018: $66.48 million). Earnings per share for the nine months amounted to $0.03 (2018: $0.04). The trailing twelve months earnings per share equaled $0.02. The number of shares used in our calculations is 1,542,467,080 units. PTL stock price closed the trading period at a price of $2.15 on April 12, 2019. As at February 28, 2019, the Company’s total assets totaled $1.32 billion, 14% more than the $1.16 billion quoted a year ago. The main contributors to this growth was the increase in ‘Receivables’ and ‘Inventories’ which closed at $455.43 million (2018: $339.46 million) and $582.93 million (2018: $444.85 million), respectively. Shareholders’ Equity as at February 2019 stood at $724.25 million (2018: $748.26 million), resulting in a book value per share of $0.47 (2018: $0.49).